What we didn’t consider was her pregnancy as we bought the wool. And a pregnancy usually follows a baby (a very cute one btw), that needs a lot of attention and time. So I waited … not for months, not for one year, but maybe it took around four years until I finally received a little package from her. I hadn’t expected it anymore. But what I also hadn’t expected was such a beautiful sweater! It was perfect. The colors, the pattern, the quality – it was absolutely stunning. And even I hadn’t tried it more than once, when it was just a blue something around my belly, it fits perfectly. I was overwhelmed and very happy and it was of no importance anymore, how much time it had taken. I got this package a few days ago and decided that this nice thing is worth a blog post. As well as the Norwegian pattern is also an important part of Scandinavian design history. So I tried to figure out more about it. First I learned, that the one I call my own now is not quite an original Marius Genser – disregarding the fact that it is not made in Norway of course. In the original design the red collar is a continuous line along the shoulders and the pattern on the sleeves is seperated from the corpus by red parts, too. Nevertheless my version is found many times when looking after the keyword „Marius Genser“ and is also sold as a version at Sandnes Garn. The original pattern was founded by designer Unn Søiland Dale (1926-2002) and published as knitting pattern no. 229 by Sandnes Uldvarefabrik in 1953. 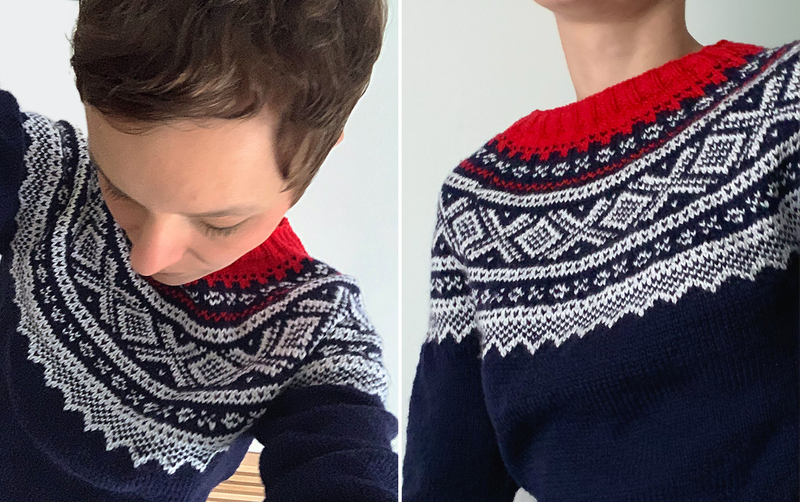 Søiland Dale was inspired by the Setesdal sweater that was already design in the middle of the 1800s. 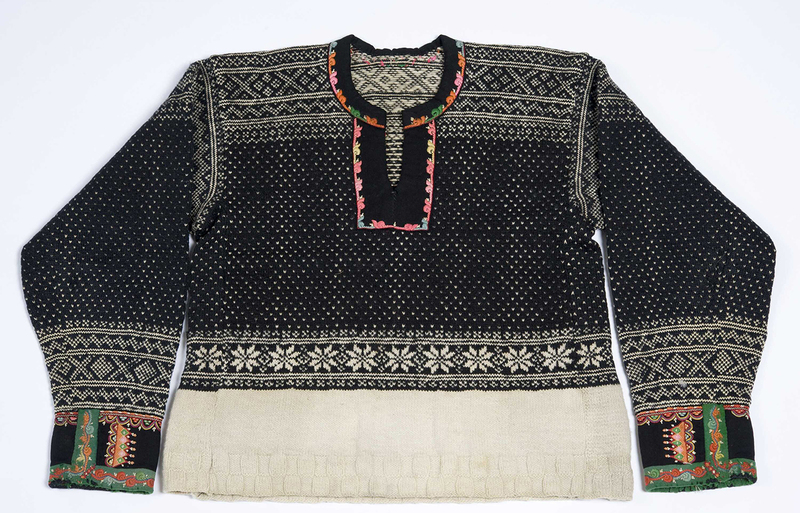 The „Lusekoften“ was originally made in black and white but after discovered by tourists around 1920 it became famous and got varied in many different colors – rarely more than three though – and is considered to be the world’s most knitted pattern. During the Winter Olympics in 1952 a sweater with this pattern no. 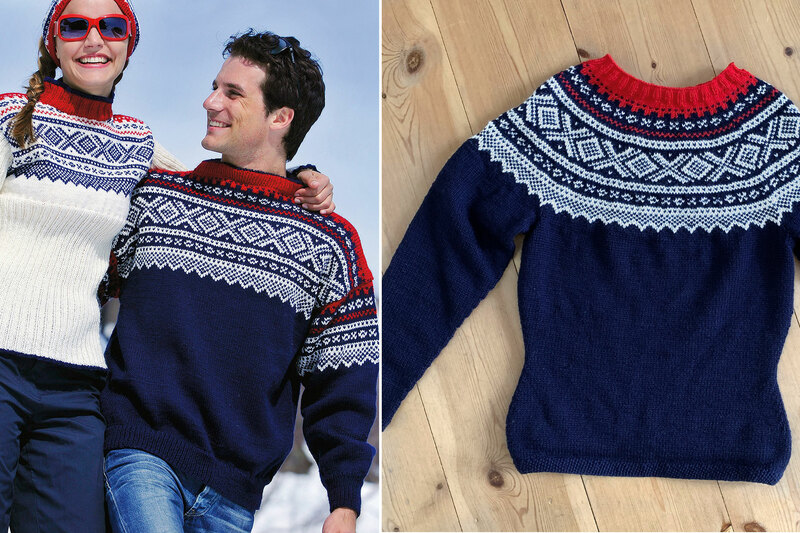 229 in the national colors blue, red and white was worn by the Norwegian ski racer Stein Eriksen and later also by his brother Marius in the movie „Troll I Ord“ (1954). This movie – and Marius Eriksen’s part as a model – were responsible for this pattern becoming famous all around Norway. So it was fast called everywhere just „Marius Genser“. Unn Søiland Dale back then has been already well-established in the design scene and could even sell her designs to french fashion labels like Dior and Givenchy. But unfortunately, as she invented the Marius pattern, she never made an agreement about the rights, for it was just meant as a knitting pattern for private people. So the only payment she ever got for it were just 100 Norwegian crowns. She never received any share from the sweater’s success that became sp famous all around the world.